I don’t care too much for carrots, but I love a good carrot ginger dressing on my salad when I go out for Hibachi. This is good stuff! It’s the perfect starter to any dish. Well, I’ve been getting requests for this for a while now, so it was time! It’s hot in New York, so too cool off I wanted a simple crisp iceburg lettuce salad for lunch. I added some red cabbage and carrots for color and enjoyed every bite! You can serve this on mixed greens, add tomatoes and cucumbers or whatever you like! 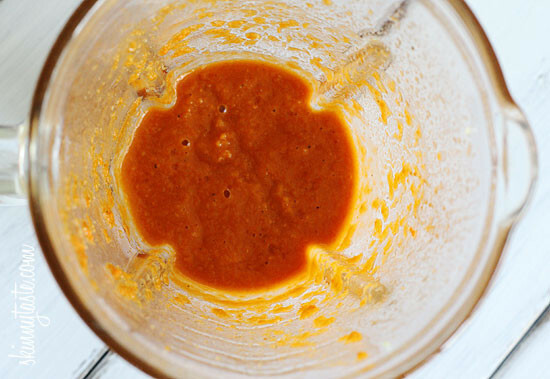 Place all the ingredient in the blender and process until smooth. Refrigerate a few hours before using to let the flavors deepen. This gets better the longer it sits. Serve on your favorite salad greens and enjoy! I just made this dressing and I love it!!!! It tastes just like the dressing on the salads that are served at the Japanese Restaurants. I made it for a side salad to go with Crock Pot Sesame Honey Chicken. Can’t wait for my family to try this tonight! How long can you keep this in fridge? i love the salad dressing at asian restaurants and this tastes just like it! Holy crap this is good! Just tried this last night (almost forgot to put in the tomato paste). Mine also turned out to be bitter. I hoping it is better today. Maybe I added too much oil and not enough vinegar? Maybe it needed more sugar? Hi, I tried the recipe and it turned out so bitter ! any advice? Made this one tonight – AMAZING!! Definitely a new favorite! I made this tonight and it was wonderful! I/ve been trying to duplicate the dressing at our local Hibachi place for my husband to work with WW. This is it!!! LOVE IT!!! can you tell me how long you can keep it in the fridge? What kind of rice vinegar do you use, seasoned?, no salt/sugar? I made this tonight on a whim. I used soaked sun dried tomatoes because I didnt have tomato paste. It turned out yummy!! Can one replace rice vinegar with say apple cider? I tried this last night, it was amazing! Better than I expected! I made this dressing tonight and all I can say is FINALLY.. an authentic version of the hibachi restaurant dressing! It is SO yummy. I used regular (untoasted) sesame oil and was a little afraid at first because it is SO aromatic and strong that I thought it might overpower the dressing. After I pureed it altogether, I was pleasantly surprised that it was just PERFECT! This dressing was absolutely delicious! Everyone love it! I would double the recipe next time, as it didn't seem to make much. Can't wait to try this this week. I can see it now – mixed green salad with Ginger-Carrot dressing and grilled chicken with Ginger-Carrot marinade . . . Top salad with chicken. Eat. Gina, Did you use roasted sesame oil or the lighter kind? Is there another use for this dressing other than on salad ingredients. I made way too much and was wondering if you had other uses for it? This is wonderful! I asked the chef at my local place what was in it, and he said if he told me, then he would have to kill me! Lol! Thank you!! YUM!! I always wondered what they put in it! I can't say I've heard of this dressing, but it sounds healthy and intriguing. Gina, I just made this tonight – tastes just like the dressing in Japanese restaurants. This was absolutely delicious! So much so that I went back for seconds. 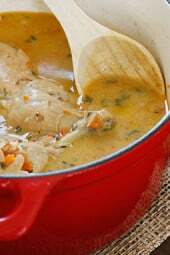 Thank you for continually sharing such great recipes. What an interesting recipe! I've never had dressing made with carrots before but, I am intrigued! This looks yummy! Can this be made in a food processor instead of a blender? The thought of all that mincing intimidates me! Sure, but it may be a little chunky. The mincing is just for measurements, but you don't have to chop so fine. Just so you can measure and throw in the blender. A friend just recommended that I check out your blog. It is delightful. Love the color of this dressing. I , too, am not a huge fan of carrots, but do like them to enhance other recipes. Will definetly try this… however if you can post a recipe for the ginger & mustard dipping sauces that they have at Hibachi restuarants they you would be my hero! Thank you, thank you, thank you for posting this! 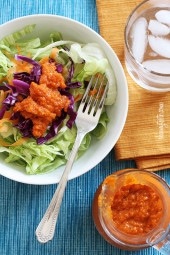 I have tried to make this dressing in the past and with some not-so-hot results. I've tried many of your recipes, Gina, and NONE have failed me. Can't wait to whip this up for my lunch salads next week! I made this tonight…THANK YOU! I love the dressing at our hibachi place but could never duplicate it! You are fantastic! oh my!!! I just made this and it is so yummy immediately….can't wait to see how it will taste after sitting for a few. Thank you!! I've been looking around forever for this recipe (a good one)!! Thank you so much, you're the best! Delicious! Love the addition of carrots to a dressing! Will have to try this out! I'm not a huge fan of the taste of peanut or sesame oil. Is there anything I can use in place of that? I feel like that is essential to the flavor, but canola should work. Gina, thank you so much!!! I was one of your readers that requested this!! Especially after I was so tempted to buy a big bottle of it in Costco but then I looked at the ingredients and figured I can make it home, but i knew if you put the recipe together it would come out really good and be perfect! I am SO excited to make this and will probably try to today or tomorrow. Mmmmm thank you again Gina, you are so great! This looks amazing! Definitely making it for my kids, they love the carrot-ginger dressing at the restaurants, now even better at home. Seasoned rice vinegar or unseasoned? Thanks! I used unseasoned and it turned out fabulous! But, seasoned probably works too. Maybe just use less salt. Can't wait to try this one… We have soy allergies in the house and just found "coconut aminos" to replace soy sauce… Tastes the same without the issues! This will be my testing recipe! Thanks Gina! 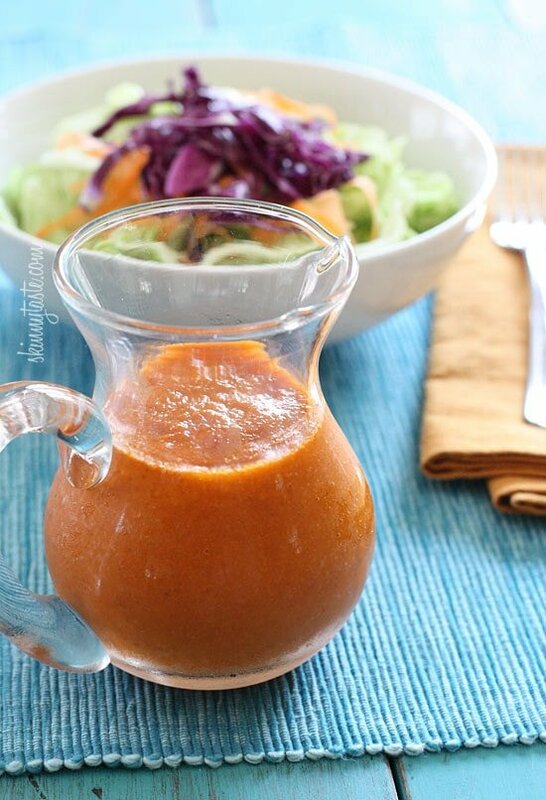 I love this salad dressing and had no idea how to make it! Thanks Gina! I have been doing many of your recipes and they are really tasty. 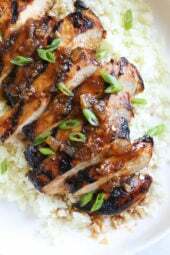 Your recipes are easy to do and I will try also this one, althougt that is the first time I hear abour Hibachi. The health benefits of carrot include reduced cholesterol, prevention from heart attacks, warding off certain cancers and many others. Most of the benefits of carrot can be attributed to its beta carotene and fiber content. This root, which has a scientific name of Daucus Carota, is a good source of antioxidant agents as well. Carrots are rich in vitamin A, Vitamin C, Vitamin K, and potassium. Benefits of carrot. Wonderful dressing! I think I am making it tomorrow 🙂 Thank you for sharing! 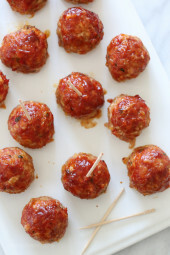 My daughter & I have been trying to duplicate this recipe without much sucess. My daughter even had our local hibachi restaurant sell her a pint of it! Caan't wait to try this! Thanks! Thank you for posting this! When I visit my sister in Manhattan, we always go to this place called Yaffa Cafe which has the best carrot ginger dressing. Can't wait to try your version! I've made so many of your recipes and recommended your blog to countless people. I lost several pounds and have been able to keep it off for almost 2 years thanks to your blog! Oh pretty please tell me this is the dressing on the salads at Osaka, Benihana & the like? If so, you are my new best friend!! You're yelling. Take off the caps lock. Yum! My mom always makes Carrot Ginger soup on Christmas Eve! I've never seen it as a dressing, looks delicious! Yummy, will be trying this one!! This dressing is so signature to hibachi and I always look forward to it! I'll definitely have to try this out… but I might have to bring home some chop sticks to eat it with. I don't think I'd feel right eating it with a fork haha. Thanks for sharing! I love homemade salad dressing. The best part of the salad at our local sushi bar is their dressing. Thanks for sharing. Your looks so similar to the one offered at Mine Sushi. I made a double batch and it only lasted three days. I found my husband licking the container it was in. 🙂 Thanks so much! This sounds fantastic and perfect for this crazy hot weather we're having. Can't wait to give it a try! I love the colour that this adds to the salad!